Two very different college towns were joined by a sense of resistance to racism. It is difficult to imagine two more different university towns than Madison, Wisconsin, and Norman, Oklahoma. Madison has a reputation stretching back decades as liberal—even radical—territory. That ain’t Norman. This week however, both of these communities were connected by the resistance of black students—along with allies and supporters—against racism. Madison and Norman are bringing together different aspects of the #BlackLivesMatter movement and demonstrating how this struggle is now firmly implanted among the young—and among young athletes—in a manner that for now seems set in stone. In Madison, several thousand high school students marched and sat in the streets demanding answers and justice after Tony Robinson, an unarmed 19-year-old, was killed by Madison police. In addition to protests and sit-ins, high school basketball fans, players and even coaches arrived at several games wearing either all-black or shirts that read #JusticeForTony or #BlackLivesMatter. 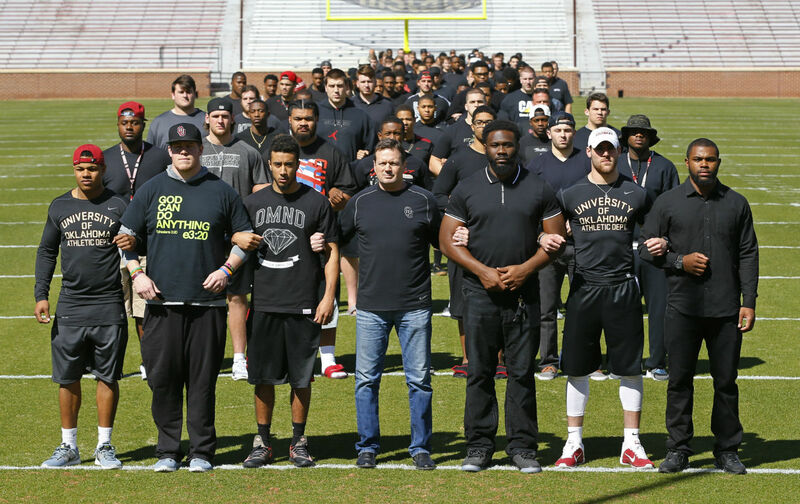 That wasn’t enought for the Oklahoma Sooners football team, who canceled their practice and, wearing all black, walked off the field to join demonstrations. It is worth noting that Oklahoma coach Bob Stoops joined his team and marched. It is also worth noting that Bob Stoops has already lost a top-rated high school recruit because of the video. As a team, our goal first and foremost is to raise awareness of racism and discrimination on college campuses nationwide…. But before we can change the nation, we make it our mission to change our campus. We seek to accomplish this goal by stepping out of the spotlight and integrating the student-athlete experience and the student experience. As student athletes of all races, classes and creeds, we hope to show the university and the community that we are defined by more than the numbers on our jerseys, and that we are human beings that desire to get to know our classmates as we all attempt to end the culture of exclusivity on this campus. Secondary to accomplishing these goals, we also seek disciplinary action for those responsible. The simultaneous real-time demonstrations for #BlackLivesMatter in these two seemingly polar opposite places of Madison and Norman speak glaringly to the fact that what they have in common is greater than what separates them. Both are state schools with small percentages of black students. Madison, with more than 40,000 students, has a black population of 2.3 percent, and OU, with an enrollment of about 30,000, has a black population of about 5 percent. Both schools field football teams that are nationally ranked, financially lucrative and highly dependent on black talent. This also means that on both campuses sports might be the most integrated public space. Several players at Oklahoma, as sports writer Aaron Leibowitz pointed out, have taken to social media to spell out the ways so-called “student athletes” can be deified on campus while being disrespected when the uniform comes off. Both the stories out of Madison and Norman brought to mind a sign held up by University of Maryland wide receiver Deon Long when attending a Black Lives Matter rally on campus that read, “Are we still thugs when you pay to watch us play sports?” The answer for too many seems to be yes. We learned this week that the cities of Madison and Norman had more in common than college life and big time football. Here is hoping that as the Oklahoma football team confronts how it is going to “step out of the spotlight” and “raise awareness of racism,” its vision includes Tony Robinson and the growing list of unarmed black women and men felled by police violence.